Healthcare analytics today needs to come to grips with the fast paced world of ever changing technology trends. This combined with the elemental nature of the erudite customer who has now become, in every sense of the word “the consumer”, providers need to be on the climbing curve of innovation, balancing longevity, consistency and reliability, all at the same time. 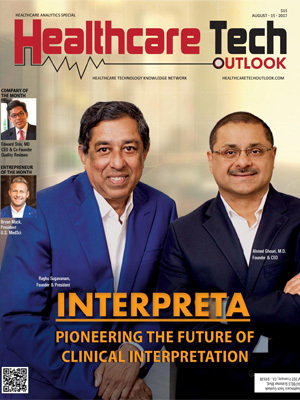 Staying true to the roots of healthcare, achieving this is more imperative today than ever before, with solutions highlighting technical prowess and simplicity called upon to enhance user experience and reduce both effort and expense. Developments in the realm of claims and cost data, pharmaceutical and research and development data, clinical data (EHRs), and patient behavior and sentiment data are taking the healthcare analytics industry into uncharted waters. Further innovations from sectors in information technology like IoT, Big Data and AI are driving home a very clear point— standard industry silos must go. Integrating them into product offerings for companies while constantly keeping an eye on priority number one—the patient, is very much the need of the hour. In enabling these prerogatives, Healthcare Tech Outlook, in consult with leading CXO’s in the industry, present the 10 Most Promising Healthcare Analytics Solution Providers 2017, to enlighten and exalt you with the visionaries of the healthcare analytics landscape today.